As I’ve mentioned before, Topo is difficult to modify and fine-tune accurately. It is not impossible, though it can be time consuming. But understanding how Topo works and triangulates can make this task manageable and much less frustrating. To start off, I have created a Toposurface with the following contour lines (though I actually used Topo From Lines, to make this one). Immediately, you can see that the Topo does not follow the contour lines accurately. 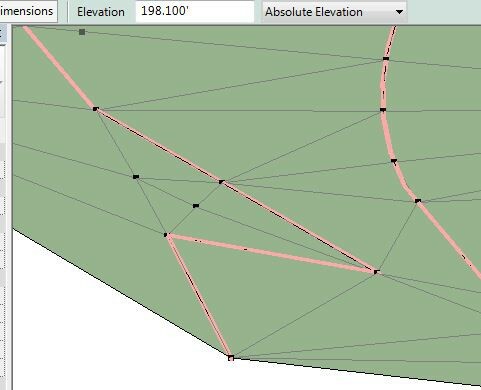 This is because Revit does not see the contour line; it only sees the points along the line. It takes all of these points and triangulates/ interpolates the grade between them. So regardless of how many points you have along a contour line, there will almost always be areas where Revit interpolates these points inaccurately (not as intended). I find sharp angles a little trickier to deal with, so let’s zoom in and take a look. For clarity, I have made the actual contour line a thick, solid red, and the Revit Topo contour is dashed black. 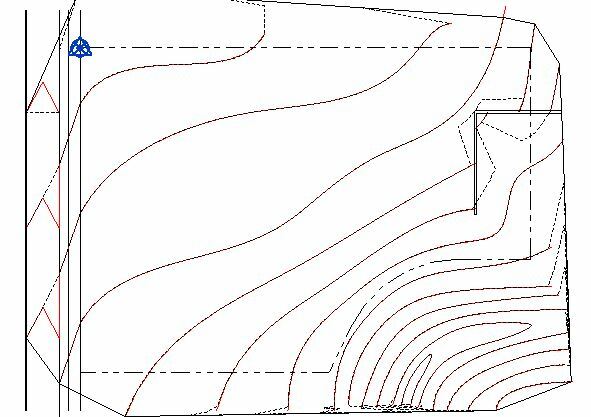 In editing the Topo, you can see that the Revit contour jumps over the corner points to the right. Now, it may be tempting to try and add more points along the contour line to “force” the Revit contour along the actual contour, but this does not work. In fact, adding more points along the line will make it more difficult. 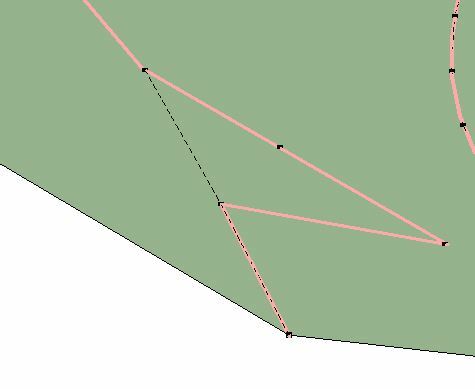 The trick to dealing with any Topo/ Contour irregularity is to look at the triangles. 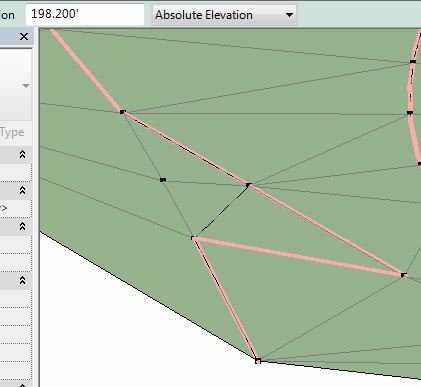 By turning on the triangles, you can see Revit’s triangulation/ interpolation at work. And by using the Spot Elevation tool, you can see why Revit’s contour “skips” those far right points. 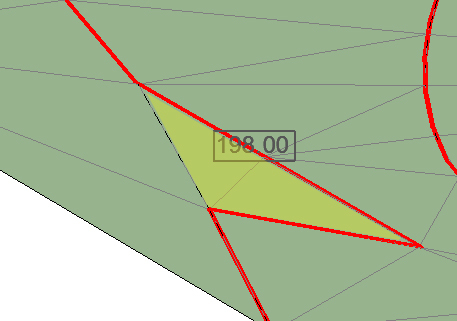 It sees the highlighted (yellow) triangle as the same height as the contour line (198). 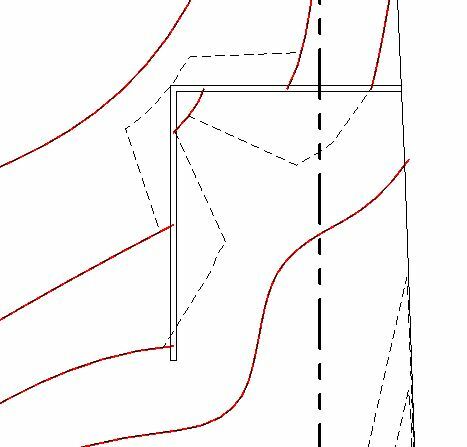 So the Revit contour takes the shortest route possible and does not go through those points. In order for Revit to match the contour lines, you must tell it that the yellow triangle area is actually lower than the contour line. To do this, I added 2 points slightly higher than the contour line. Each point was placed along a midpoint of an existing triangle, modifying the interpolation and creating more triangles. 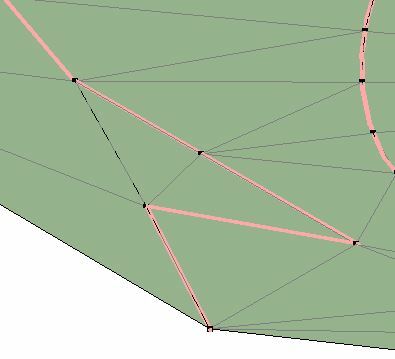 Turn on Triangulation and add point along these existing edges/ lines. This will minimize the number of points that you will have to add. Simplify the Surface and points along contour lines. This will reduce the number of triangles, which also reduces the number of points needed to modify those triangles.